The factory defaults have changed over the years and vary on Windows and Linux and 32 and 64 bit systems. So before you complain about poor performance keep in mind that the factory defaults try to find a healthy compromise between the extremes. The first 2 factors will vary from VM to VM so we can ignore them for now. Do not set this manually unless the amount of memory available is definetely wrong. Usually VMware sets this value automatically and you do not have to set this. If you have to set this manually use settings like 90% of the available RAM for normal operation. is useful if you want to run many VMs with the price of a reduced performance. 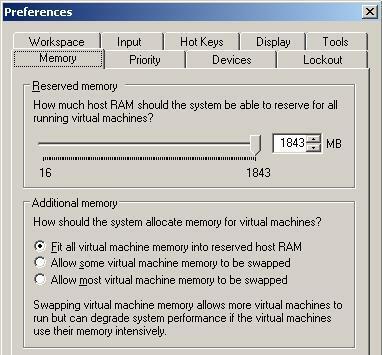 How should the system allocate memory for virtual machines ? The performance differences using this different settings are significant ! Use 100 to run a few VMs with best performance. Use lower values if you want to run many VMs at the same time. The factory defaults for prefvmx.minVmMemPct have changed over the years - so if you want to make sure you get the expected behaviour set this parameter yourself. Where should the system store the file used to backup virtual RAM ? While a VM is running VMware needs to create a file to backup this memory. This file will be created when you start the VM and it will be destroyed if you power off the VM. If you suspend a VM this file will be renamed and it will be stored in the directory of the VM. The location where this file is stored has a big influence on the performance of the VM. The fastest location for this file is inside the real RAM. If this file is stored on a slow USB-stick obviously performance suffers a lot. The location to this *.vmem file can be changed - either per VM or host-wide - so that it affects all VMs you have. So if you want to set the path for a single VM use the vmx-file. WARNING: the syntax for this parameter has changed with the introduction of WS 7 so carefully read the next chapters. Don't be surprised if old tweaks no longer have the expected effects ! creates a *.vmem file with a random name inside the directory of the vmx-file. This file will be destroyed when the VM is powered off or it will be renamed when the VM is suspended. This file will be destroyed when the VM is powered off or it will be stored as *.vmem file inside the directory of the vmx-file when the VM is suspended. Obviously the best performance for a single VM will be achieved by storing the *.vmem file in real RAM but due to rests of old code inside WS and Player the max amount of virtual RAM that can really be allocated in real RAM is 1600 Mbs. So a VM configured with lets say 3 dims a 512 MB = 1536 MB should have the most responsive RAM possible with WS. Taskmanager should show about 1600 mbs of RAM-usage for the process vmware-vmx.exe. Obviously the best performance for a single VM will be achieved by storing the *.vmem file in real RAM. do I have enough space in /tmp ? The parameter mainmem.useNamedFile will be ignored. To run many VMs use "named"
There are a few more parameters that can be used to fine-tune the performance of a single VMs but we have covered the basics now.